Lent is a season when many of us think about something to “give up.” Unfortunately, these things often have little impact upon our life and walk with Christ. With that said, let us “40 Things to Change during Lent.” But this list is different. It is not the typical things like “giving up” soda or chocolate. These are things truly worth changing as they fundamentally change ourselves. There is one for each day of the season. And these are things to change not just for Lent, but for the rest of your life. Fear of Failure – You don’t succeed without experiencing failure. Just make sure you fail forward. 2. Your Comfort Zone – It’s outside our comfort zones where new discoveries are made. 4. Impatience – God’s timing is the perfect timing. 5. Retirement – As long as you are still breathing, you are here for a reason. You have a purpose to influence others for Christ. Our work is not always tied to a paycheck. 6. People Pleasing – I can’t please everyone anyways. There is only one I need to strive to please. 7. Comparison – I have my own unique contribution to make and there is no one else like me. 8. Blame – I am not going to pass the buck. I will take responsibility for my actions. 9. Guilt – I am loved by Jesus and he has forgiven my sins. Today is a new day and the past is behind. 10 Over commitment – Do less better and accomplish more. 11 Lack of Counsel – Wise decisions are rarely made in a vacuum. 12 Impurity – Live lives pure and without blemish. 13 Entitlement – The world does not owe me anything. God does not owe me anything. I live in humility and grace. 14 Apathy – Life is too short not to care. 15 Hatred – Do not be overcome by evil, but overcome evil with good (Romans 12:21). 16 Negativity – I will put the best construction on everything when it comes to other people. I will also minimize my contact with people who are negative and toxic. 17 The Spirit of Poverty – Believe that with God there is always more than enough and never a lack. 18 Going Through the Motions – The more you invest yourself, the more you will get back. 19 Complaint – Instead of contributing to the problem, be the solution. 20 The Pursuit of Happiness – God wants something greater and more lasting than happiness. It is called joy. 21 Bitterness – The only person I am hurting by holding on to this is myself. 22 Distraction – Life is filled with distractions that will take our eyes off the prize. 23 Giving up – God never gives up on us. 24 Mediocrity – If you are going to do something, then give it all you got. 25 Destructive Speech – Encourage one another and all the more as you see the day approaching (see Hebrews 10:25). 26 Busyness – It is a badge of honor to be busy. But that does not always translate to abundance. 27 Loneliness – With Jesus I am never alone. He is with me wherever I go. 29 The Quick Fix – Rarely does true transformation happen overnight. 30 Worry – God is in control and worrying will not help. 31 Idolizing – Don’t assign anyone a standard they cannot live up to. 32 Resistance to Change – Change is certain. It is not if we will change, but how we will change. 33 Pride – Blessed are the humble. 34 Small View of God – Don’t tell God how big your problem is, tell your problem how big your God is. 35 Envy – I am blessed. My value is not found in my possessions, but in my relationship with my Heavenly Father. 36 Ungratefulness – You have been blessed in a way greater than you realize. 37 Selfish Ambition – God has a mission for me that is bigger than me. 40 My Life – Whoever loves his life loses it, and whoever hates his life in this world will keep it for eternal life (John 12:25). God has so much more in store for you. But so many of the list above hold us back from walking in the full destiny God has laid out for us. Today is a new day. 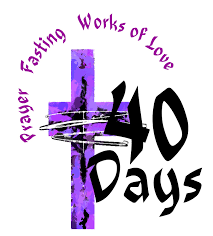 So there you have it – The 40 Things to Change during Lent! What else might you add to the list? What would you take away?